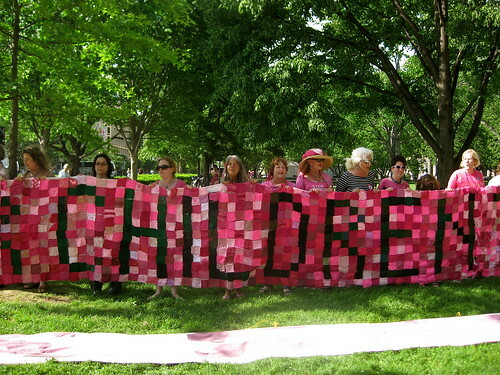 Recently I contributed six pink and green knitted squares to the thousands collected for the White House fence cozy that Code Pink used in its 2009 Mothers’ Day vigil for peace. 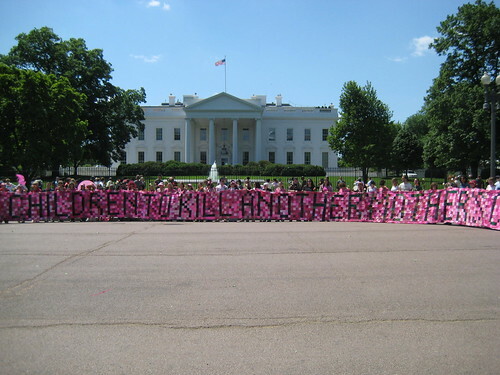 This was Code Pink’s second 24-hour vigil in front of the White House in honor of all mothers and women living under occupation and war zones, for whom the price of war is the safety and lives of loved ones, their homes, and their future. With roses lifted and giant cozy unfurled, hundreds called for the return of US troops from Afghanistan and Iraq, so that no more mothers will grieve the loss of children in these wars. $10 will enable us to buy a backpack full of schools supplies for a child. $50 will enable 5 children to have the tools they need for the school year. $100 will help build an International Friendship Playground at one of the schools destroyed during the invasion. Rational (Jewish) Voter 9: changing partners for peace? If Israel’s security is on the top of your agenda, what do you need to know make an informed choice in the upcoming presidential election? Wouldn’t knowing something about the views of some of Israel’s most respected military and intelligence experts about the impact of the Bush/McCain foreign policy on Israel, the need for the United States to engage directly with Iran, and Senator Barack Obama help? Well, thanks to the Jewish Council for Education and Research, we all have the chance to hear what some Retired Generals of the Israeli Defense Forces and high-ranking Mossad officials on Barack Obama have to say about who will be Israel’s best partner in the White House and why (or here also). It might also be helpful to review Barack Obama’s speech at AIPAC. Shouldn’t we help Israeli military and security experts get the diplomatic change they want? While passing through a marketplace, Rabbi Kehot of Veritch, a disciple of Rabbi Israel Baal Shem Tov, overheard a conversation between two horse dealers. “I was thinking,” said one to the other. “What does the psalmist mean when he says, ‘Do not be as a horse, or a mule, without understanding, their mouths stopped with bit and bridle’? [Psalms 32:9.] Well, when you put a bit in a horse’s mouth, he thinks that you are giving him something to practice his chewing on. Don’t be like a horse, King David is saying. When your Heavenly Master sends something your way, understand that it is more than something to chew on…” Rabbi Kehot related this exchange to his teacher. The Baal Shem Tov was greatly excited by the horsedealer’s insight, and was inspired to a state of d’veikut (meditative attachment to G-d). In his ecstasy, the Baal Shem Tov began to sing a melody. This is the melody to which the rebbes of Chabad would pray on the first night of Rosh Hashanah. (source). May the sound of the shofar this year motivate us all to recognize that we’ve been given an extraordinary opportunity this year to act for change in our country, and for a secure and peaceful future for ourselves, our children, our communities, our country and our global neighbors. Don’t just chew … vote! To a healthy, sweet and productive new year. (and if you’re inclined to model action instead of chewing, to wear your politics on your sleeve – or in this case, your keppe – make and wear your own Obamakah (Obama + yarmulkah); I embroidered mine after knitting and felting one based on CozyColeman‘s pattern (available here). 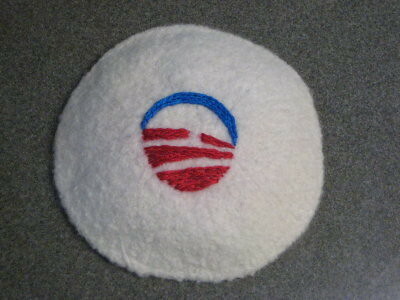 Or get a specially-printed suede Obamakah here from Jews for Obama. One of the many interesting consequences of Sarah Palin’s nomination to the GOP ticket and her acceptance speech is the way in which she’s stimulated grassroots action and organizing in Democratic circles, and more than a bit of creative action. Those of us who have made committed ourselves to public interest professions, or made community service and volunteering an integral part of our lives, or taught stewardship to our children, or actively supported political candidates, or acted in support of public issues … well, many of us smarted at Gov. Palin’s dismissal of Barack Obama’s lifetime of work in the service of his community. Like so many of our Republican colleagues, we’ve lived our lives with the understanding that community service, even community organizing, put us in pretty good company. (Community Organizer icons courtesy of Rainne, include (from top left): George Washington, Sojourner Truth, Susan B. Anthony, Alice Paul, Eleanor Roosevelt, Mahatma Ghandi, Martin Luther King, Jr., Robert Kennedy, Mother Theresa, Aung San Suu Kyi, His Holiness the Dalai Lama, and Barack Obama) (more available here). 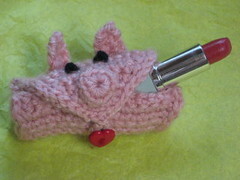 Lately, I’ve added politi-knitting (and crochet) to my repertoire of more conventional campaign-related community organizing … pigs in lipstick have been flowing from hooks and needles. If the prospect of having your own 3″ pig in lipstick badge (similar to the one at left) organizes you to make a contribution to the campaign (($25 or more, please! ), contact me (at: tikkunknits(at)yahoo(dot)com) and I’ll send one along – at least until my bag of 50 badges is empty. Go ahead … organize your community! 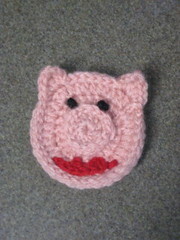 Materials: some pink yarn, a size F or G crochet hook, scraps of red and black yarn (for the mouth and eyes), a tapestry needle, a large safety pin. 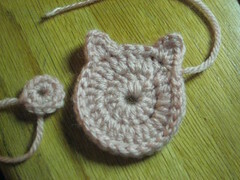 Round 1: Work 12 dc in a “magic ring” (or, ch 4, join with a slip stitch to close, ch 3, then make another 11 dc). Close this round with a sl st in the second ch at the beginning. Round 6: ch 1, then make first ear: 1 sc, 1 hdc in next st, 1 dc and 1 trc, ch 4, and sl st in next st;, sl st in next 6-8 sts, then make second ear: ch 4, 1 trc and 1 dc in same st, then 1 hdc, 1 sc and 1 sl st in next st, then sl st around entire head. Break yarn, tie off and weave in end. Embroder eyes (two large french knots will do) and mouth (I use 8 chain sts for the lower lip, two pairs of sts for the upper lip). 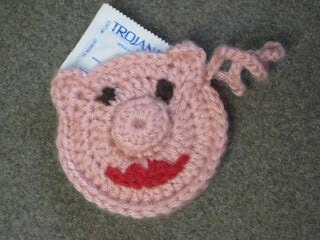 To make a small pouch, pocket keychain or condom amulet (more information here and here about the Condom Amulet Project for women’s health): simply make a plain face piece first without a snout, then the face piece with snout. After adding the second ear, sl st the two pieces together (right sides facing out), break yarn, tie off and weave in the end. Add a keychain or chain stitch a handle at the end of the row. 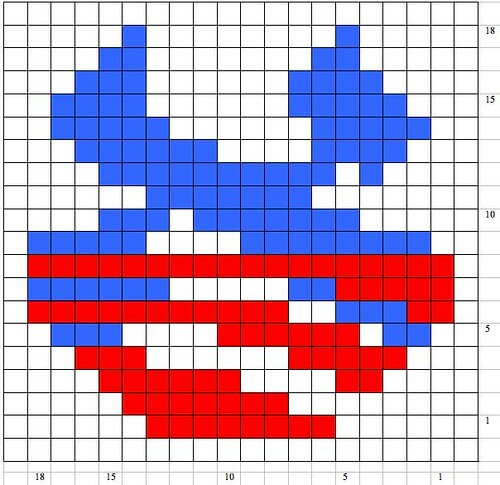 This pattern has been made available for personal use only, and for fundraising for the 2008 campaign to elect Barack Obama and Joe Biden, and for no other commercial or financial use. All other rights are reserved. Round 2: Ch 3, dc in same st, 2 dc in each st around. Close the round as before. Round 3: Ch 3, *2 dc in next st, 1 dc in next st*, repeat ** around. Close the round as before. sl st around to first ear. Sl st to close the round, break yarn, tie off and weave in end. To make the snout: Work 12 dc in a “magic ring” (or, ch 4, join with a slip stitch to close, ch 3, then make another 11 dc). Close this round with a sl st in the second ch at the beginning. Break yarn, leaving a long tail and sew the snout to the face. To finish: sew the snout to the face, embroider the eyes (some large French knots work fine) and luscious mouth (8 chain sts for the lower lip, two pairs of sts for the upper lip). Grab a safety pin and wear proudly beside your Obama button. Add a keychain instead, or stitch to a barrette blank. It’s been a while since I’ve been able to celebrate Passover (Pesach) without discomfort. Initially, the challenge was trying to reconcile historical and archeological knowledge I’d been studying with my Hebrew school education and my life experience at the seder table. 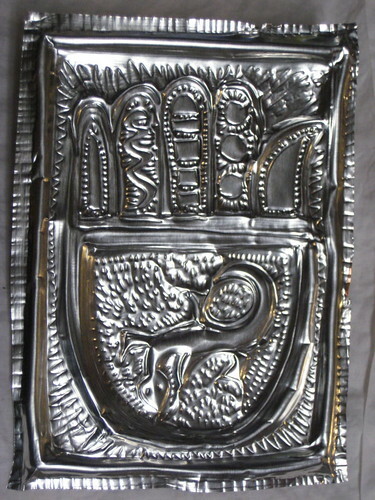 I was deeply troubled by the gap between the archeological record and the fictions of Jewish tradition — unfortunately, in spite of the considerable efforts of both Christian and Jewish biblical scholars and archeologists, little positive evidence exists to support one of the central narratives of Jewish identity: the Passover Maggid, the retelling of the Passover story of Israelite liberation from slavery from Egypt. My discomfort increased along with the harsh Israeli military occupation of Palestinian territories and continued (settler) abuse of Palestinian civilians. This has been more than a slight predicament. Like most American Jewish children of the 1960’s, I’d seen Charlton Heston in The Ten Commandments. 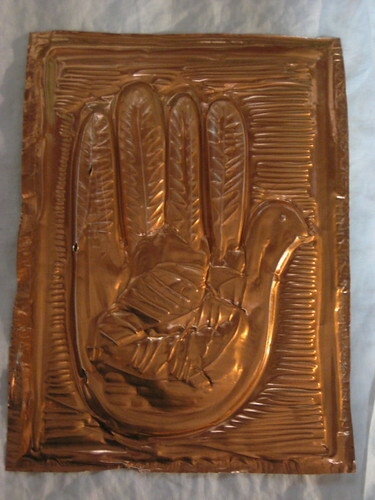 So I knew about Moses and the burning bush, his threats to Pharoh to “let my people go” before each of the ten plagues was inflicted on the Egyptians to persuade them of the superior power of the Israelite god, and how the Israelites baked their bread before it had risen in their haste to leave Egypt. And I’d watched the Red Sea part to enable the Israelites’ escape, and then engulf the Egyptian army. I knew the Passover story backwards and forwards Memories of Passover seders during my childhood were among my most powerful and positive. Year after year I’d sat at the seder table with family and friends to retell the Exodus narrative and eat matzoh (“unleavened bread”), the holiday’s primary symbol (of the hasty departure from Egypt). So as with most of the non-fundamentalist Jewish community, Passover was one of my most significant connections to Jewish identity. I grew up with the Reform community’s familar gray Union Haggadah, but my lifelong passion for Jewish history and book culture had led me to create a respectable collection of facsimiles of medieval, early modern and modern haggadahs. The internet enabled me to acquire copies of the Birds Head Haggadah (13th c.), the Golden Haggadah and Kauffman Haggadah (14th c.), the Rylands Haggadah, Sarajevo Haggadah and Ashkenazi Haggadah (15th c.), the Copenhagen Haggadah and copies of early modern printed haggadahs (17th & 18th centuries) and modern examples like Arthur Szyk’s post-war haggadah, Shalom of Safed’s folk art haggadah, and Leonard Baskin’s distinctively-illustrated version (many images here). My collected haggadot were precious threads of contact with a Jewish past; their visible signs of seders from the distant past – wine stains, drops of wax, soiled page corners – offered me powerful contact with the continuity of a tradition dating to the second century of the common era. (Contrary to popular misunderstanding, both Jewish and Christian, the formal, haggadah-directed seder post-dates the life of Jesus and destruction of the second Temple in Jerusalem). Like other Jewish mothers, I’d carefully and lovingly prepared seders for my family and participated in seders with other families to insure transmission of Jewish identity to the children at table. I rehearsed the Four Questions with my sons, and prompted the children to tell The Story year after year. I began my own serious study of the archeology of the Exodus when my children were nearly grown, and was able to process the limited evidence in the context of more sophisticated conversations at the seder table. Texts such as Exodus: The Egyptian Evidence, ed. Frerichs, Lesko & Dever (1997) (a fine review here), and James K. Hoffmaier’s Israel in Egypt (1999) (available in preview here) offer the basics on the principal controversies involved in the debate – whether the Exodus happened, was there a substantial Israelite population in the region at the time, who built the pyramids, etc. (A similar controversy exists regarding the Dead Sea Scrolls (see Nathan Golb’s, Who Wrote the Dead Sea Scrolls (1996), which describes the scholarly and political suppression of evidence regarding the authorship of the scrolls). My concerns about the absence of evidence of the Exodus have to do neither with faith or identity – my Jewish identity comes from my relationship to a human community tradition of considerable duration, even if not as aged or well-documented as some would like to believe. No, my issues with Passover are entirely parental and political: how to tell the story of Passover responsibly, in a manner consistent with reality (and evidence) rather than community fiction, and how to teach my children to relate to the modern state of Israel in light of the evidence (after all, I ask them to use evidence carefully in all other aspects of their lives). I cannot ignore the archeological record (or lack of it), and therefore I am unable ethically to make claims to territory on the other side of the world on the basis of such a narrative, even a treasured narrative. 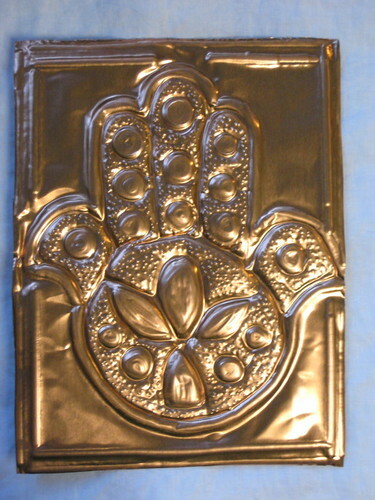 Israel’s 40+ year abuse of Palestinians (and its own indigineous Arabs) so challenges me that I redouble my effort to draw universal meaning from the traditions associated with Passover. The Exodus as a metaphor – and the extensive history of Passover observance – speak volumes to me about Jewish experience of living in the world, about a history of anti-Semitism, and Jewish response to it. 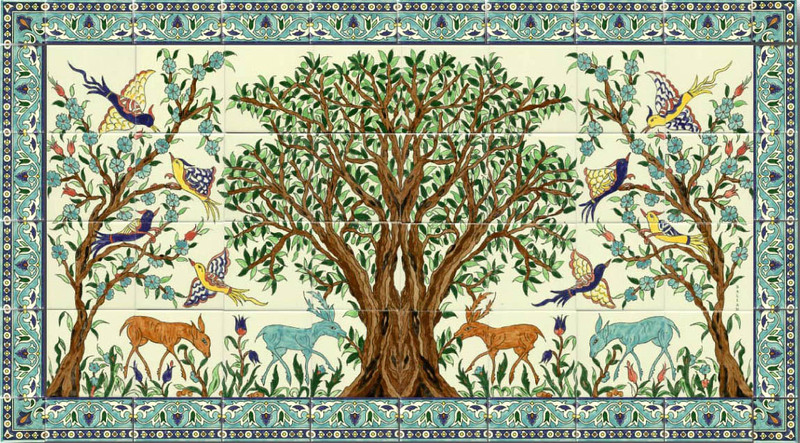 I can connect to Passover tradition as a creative response to the challenges of persecution since late antiquity. And it is this meaning I have tried to share with my family, and which I sought to explore as I prepared for the holiday this year. 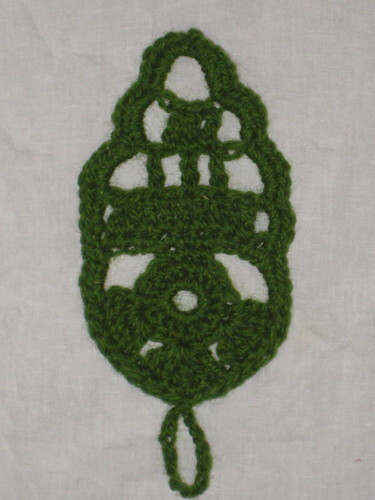 So I’ve begun a rather ambitious new project, a (tikkun) “knitted seder” … As I researched the iconographical tradition of the familiar ritual symbols of the holiday, I was inspired to use this tikkunknitting project as the point of departure for a broader exploration of the ways in which holiday traditions and meanings are created. I’ve begun with the tradition of Elijah’s Cup. 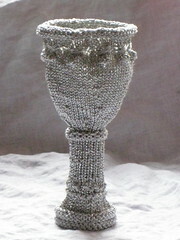 With the continued conflict in Israel-Palestine, it seems appropriate to initiate a tikkunknitting project with Elijah’s Cup, the material expression of hope for an age of peace. In the Middle Ages, Jews invoked this fantasy of divine retribution as a poultice for the wounds inflicted during our long history. This bitterness was understandable, if unproductive. Now we live in a time that we are ostensibly free, yet the nations who actually invoke God’s name continue to desolate one another. God’s Holy Land is riven by terror and revenge. Jacob’s forbears, Isaac and Ishmael, remain gripped in the medieval mind-set. Despair makes us yearn for the arrival of Elijah. We cannot bear to wait any longer. We cannot endure endless war. Elijah seems but a faint hope, not a solution. Tonight, we open the door to our neighbors, to dwelling with one another in quiet and shared delight. As we open the door we raise our fourth cup in a toast to the fresh breeze of renewed commitment, to the rejection of hate, to embracing hope, and to the hard work of making peace. And, we raise our glasses to life. 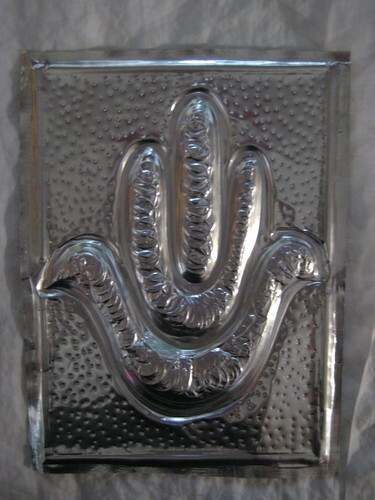 We pray this “LeChaim,” will bring us the longed-for redemption. Let this be the way we welcome Elijah. 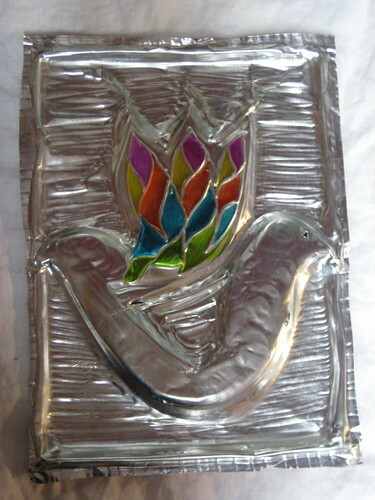 When my family opens the door at the end of seder this year, we will look hopefully to the virtual arrival of the prophet Elijah and the real fulfillment of the prophecy of peace – for all peoples, but with special hope for Jewish commitment to an end of the Israeli occupation of the occupied Palestinian territories and its concomittant abuse of Palestinian people, and end to the cycle of violenc, and the arrival of Jewish commitment to a just peace between Israel’s Jews and her many Arab neighbors. More information about the pattern for this knitted Elijah’s cup will be available when it is added to my collection of knitted Judaica and Patterns for Peacebuilders to support co-existence and peace-building efforts taking place between Israeli Jews and Palestinians. understanding within my family for different views and different ways of doing things. All of these found their way onto my list, along with a few others regarding local concerns as well, chief among which were wishes for the continued reduction in the number of homicides in my city, and care and reconciliation within the Democratic party (Clinton and Obama campaigns), so that eventual unity and electoral success can be achieved. Friday was also the Jewish holiday of Purim, so my knitting time was also devoted to thinking creatively about the relationship between the Jewish holiday of Purim and peace (a few recent essays on Purim violence and traditions certainly stimulated me), and ways to promote the pursuit of peace in the American Jewish community. Much creativity will be needed in this endeavor, so I’ve been working on variations of “co-existence leaves” for the TikkunTree Project. 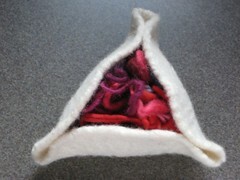 I also worked on a felted “Peacetaschen” Hamentaschen cookie. I’ll have more to add about Purim and the Peacetaschen shortly. 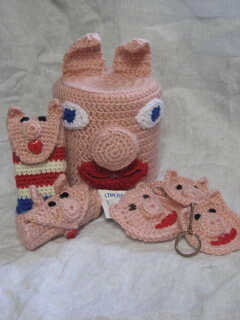 It’s especially gratifying to have knittivist colleagues in the virtual needlework community. I recently had the pleasure of stumbling into the sub-community of knitters for peace. There’s Ravelry’s “Knitting our way to Peace” group (moderated by Hanane of Knitting Our Way to Peace), which carries on a stimulating conversation about matters of religion and religious practices, peace, and ways to use our skills to promote peaceful thoughts and action. Another Ravelry member, Sophia, recently initiated the 198 Countries Peace Project, looking to join the flags of the 198 countries of the world; I’ve volunteered to make the Israel & Palestine Flags, which I plan to join – at the hip, like Siamese twins, which is how I see the two communities (if you are interested, you can read more here). I’ve already charted the pair of flags and the way I plan to unite them. I’ll be using Peace Fleece yarns (of course). (the project still needs volunteers for some of the countries, so join in!). because of the symbolic value of seeds. Lao Tzu said, ‘To see things in the seed, that is genius.’ Seeds promote growth. I wanted the stitches to be seeds for self-love and compassion with the reminder that gardens, knitting, and people take time to develop. We need to fertilize and water ourselves with patience, kindness, and insight and not expect results instantaneously. 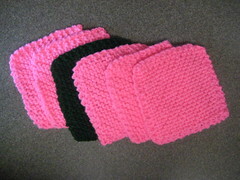 I begin the ritual of making the Seeds of Intention Scarf by washing my hands. This is my transition from the daily grind of endless ‘must do lists’ to the sacred time of quiet reflection. Next, I light a candle to welcome inspiration. Then I take my […] yarn from its embroidered bag, place a clean white cloth on my lap, and begin to knit. Slowly. Each stitch is a seed of intention for something I want or need. 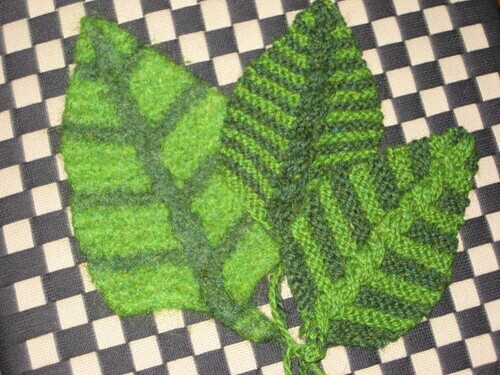 If I am feeling anxious, I may knit an affirmation such as: I am secure and connected to myself and others with compassion. If someone I know is ill, I wish that person good health through my stitches. 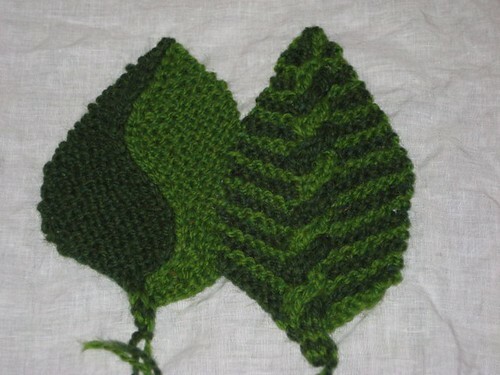 I knit to support qualities in myself that I want to cultivate: kindness, hope, clarity, and love. This knitting meditation kept me balanced and centered during the entire writing process. Though I’m somewhat uncomfortable with creating a special ritual for my own tikkunknitting. 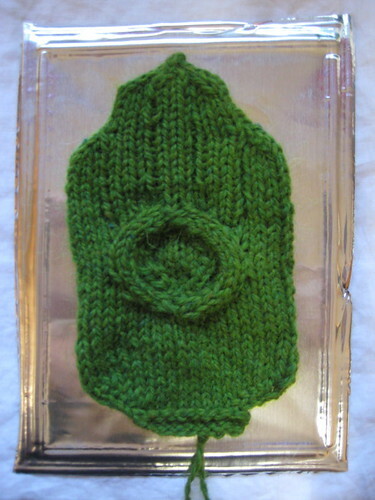 I’ve been thinking about the way in which my knitting can reflect my personal expression of tikkun olam. I share Ross’s interest in the symbolism of stitches, and have been thinking about patterns that might, beyond the work of the TikkunTree Project, express my commitment to a just peace in Israel. 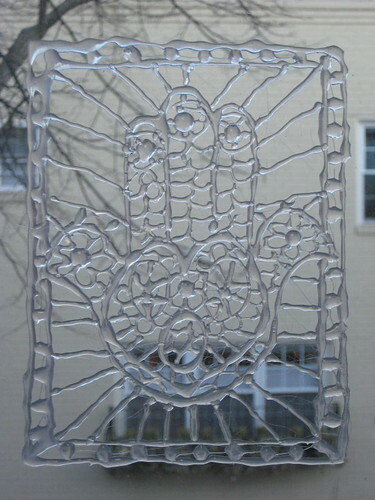 I envision Hebrew and Arabic prayers for peace across the boundaries of my knitting, or the flora and fauna of Israel-Palestine traversing hats, sweaters, and more. I’ve also been working with teenagers in my Reform synagogue’s Confirmation Academy (post-bnai mitzvah program), attempting to teach tikkunknitting – to help them make a network of connections between the work of their hands (the new knitting skills they are learning), heart (the impulse toward tikkun olam, to engage in repair of their world through social action), and heads (decisions about materials and people to knit for). There’s more discussion about “Hands-On Spirituality” here.